Penny Path Cafe & Crepe Shop can take credit for some of the revitalization of downtown High Point. What appeared to be a ghost town one Sunday morning quickly transported me to Portland or Brooklyn, a funky city with a hip neighborhood coffee shop and cafe scene. The art, the vibe, the service - this is such a fun and welcoming spot. The chef/owner will talk to you over the counter to make sure you like your food - or perhaps he'll suggest that "Feta would be really tasty in your crepe, want me to add some?" This is my kind of place. 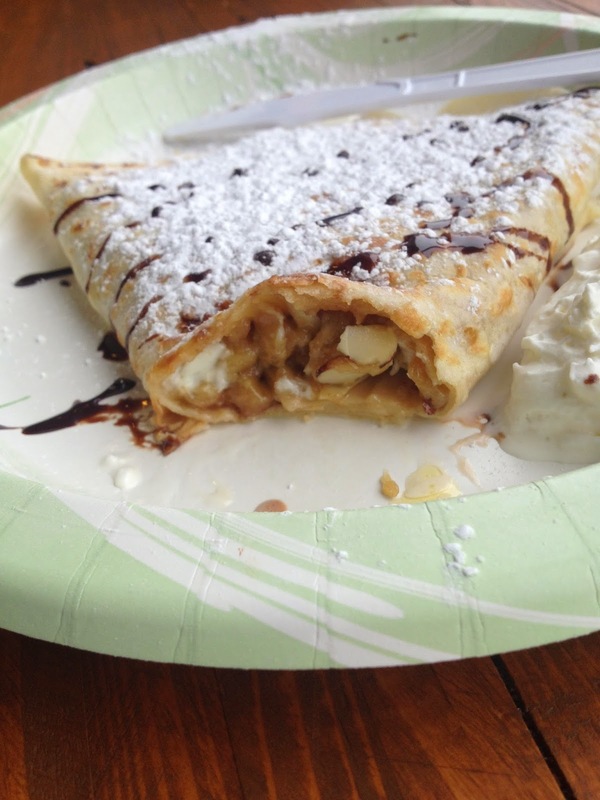 When visiting a creperie, it's imperative that you get both a sweet and savory option. 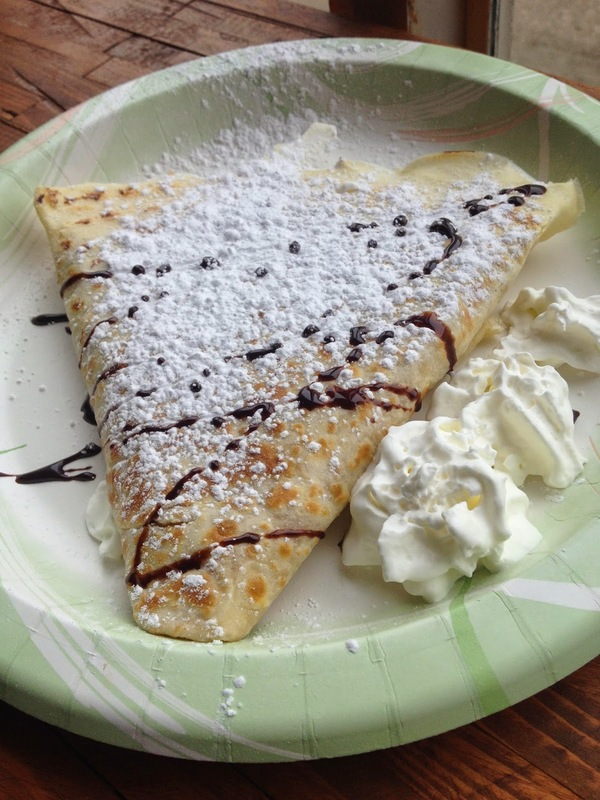 I've had crepes on my mind since I dined at Sweet Paris Creperie in Houston, so I was delighted to hop over to High Point for this mouthwatering brunch. My savory option was a "Create Your Own," with Scrambled Eggs, Roasted Red Peppers, Feta Cheese, Spinach, Diced Tomatoes and a Red Pepper Spread. The griddle nicely charred up the edge of my crepe, which I loved, giving just a little extra crispy bite of saltiness. The Red Pepper Spread is not unlike Marinara sauce, a little reminscient of a pizza, but the lightness of the crepe is the star here. Put whatever you want in it, you'll love it. It's not paper-thin, a bit more toothsome, which is a good thing. Half of one is plenty to fill you up. It took me 2 seconds to decide on the sweet option: the Sweet Surprise features White Chocolate Chip Macadamia Nut Cookie Dough - I nearly passed out upon reading the description. It's store bought, but who cares? Throw in some syrupy sliced Almonds, Coconut and Nutella, dust it with a little Powdered Sugar and drizzle it with Chocolate Sauce - I would have eaten 15 of these. Cookie Dough on anything is amazing, but when enveloped in this delicate crepe blanket, I was speechless (probably because I was stuffing my face.) How could your day be bad after having this? The owner and his family are incredibly personable and kind. Penny Path has been open for 2 years, and they're planning to expand to the next building for additional seating room and more kitchen space. The owner hopes to invite guest chefs to feature brunch options! I'm very excited to have found this place, although it doesn't appear to be a secret - no more than 5 minutes after I left, I found out a friend had just arrived to enjoy some crepes himself! I think this spot is still a hidden gem to most people, so I'm taking names of those who'd like to return with me promptly.